Over the last thirty years, I have been lucky enough to fly alongside and photograph the amazing talent that is Mark Jefferies – with him flying everything from a Bucker Jungmann, Pitts, Laser, Yak-52, Yak-11, along with a variety of aerobatic designs from Walter Extra. 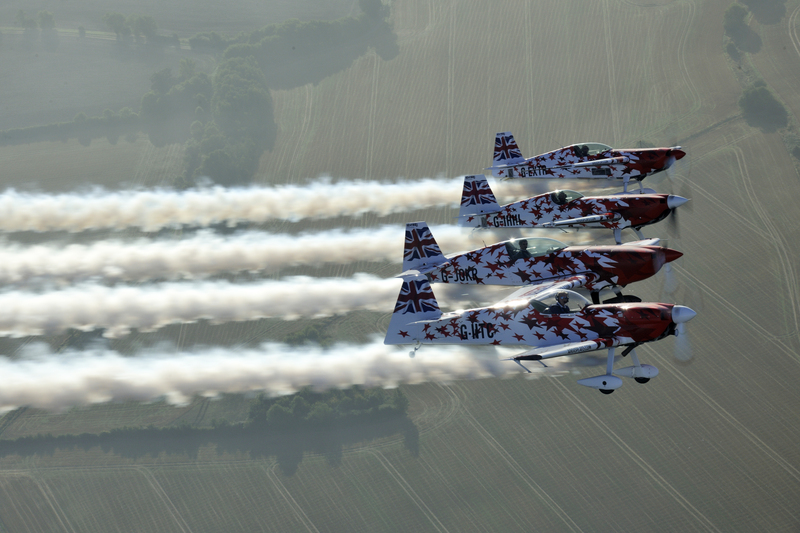 The most recent assignment saw me hanging upside-down in my straps in the front of an Extra 300L, superbly flown by Chris Heames, while flying above, behind and alongside the UK’s latest formation display team phenomenon The Global Stars. It is these images that illustrate this profile of the formation display team that has rapidly become an amazing success on the international air display circuit. Mark Jefferies has been involved in aviation for as long as he can remember. He flew regularly with his father Len, from their family strip at Fullers Hill Farm, now better known as ‘Little Gransden International’, regularly taking to the air in a Tiger Moth or Bellanca Scout, often involving aerobatics As soon as he was old enough, Mark wanted to learn to fly, and at 17 he gained a gliding scholarship with the Air Cadets at Henlow. Later, at 2, he was placed under the watchful eye of Norman Whistler (a wartime RAF instructor on Harvards in Canada), to learn in the family Scout. After completing the early training, Mark quickly went solo and soon progressed onto advanced stall and spin training, when on one lesson he recalls, following numerous spins with Norman, Mark was air sick – the only time in his life he has ever suffered with it. Later in the training, Norman sent him off solo “to fly around for an hour” without actually specifying the type of flying required. After leaving the airfield, Mark immediately climbed up to 5,000-feet and started to practice spinning on his own – his very first solo aerobatics – for the duration of his solo slot! Later, after passing the GFT and with a few more hours needing to be flown to finish the course, Norman and Mark utilised the time completing dual aeros. Clearly, Mark was hooked! Around the same time, Mark had been rebuilding a Spanish-built CASA Jungmann; although by his own admittance, it was probably a little advanced for a new PPL holder to fly. Consequently, Mark spent around 50-hours in a Tiger Moth, once again under the watchful eye of Norman Whistler before flying the Jungmann. In 1984, at his first ‘unofficial’ competition at a Moth Club event, Mark (along with his friend, Neil Jensen) was challenged by Barry Tempest to enter and fly what for Mark and Neil was an unknown sequence; although every other competitor had received advanced warning and had time to practice. The event was won by Neil Jensen, with Mark finishing second, ahead of all of the Tiger Moth owners! In 1985, Mark started competing seriously in the British Aerobatic Association aerobatic events at Standard Level in his Jungmann. He was placed second in the first event and won all of the remaining events including the Nationals that year. Mark quickly progressed through the Intermediate and Advanced levels, with a number of successes in a Pitts Special. Meanwhile, Mark was building the Laser and in 1991 he started competing in it. He also represented the Great Britain Team in 1992 and 1994 at the European Aerobatic Championships and in 1992 World Aerobatic Championships. In 2003, Mark acquired a very tired Extra 300S with Kester Scrope. After rebuilding it, they started to compete at the Unlimited Level and eventually Mark won the Nationals in 2005, 2006 and 2007. Mark then competed in the World Unlimited Aerobatic Championship in 2007 in an Extra 300S, at a time when most competitors were now flying Cap 232s and Sukhois – the Extra being considered five-years out of date! He finished a very creditable eighth in the men’s and ninth overall, where he beat a number of the Russian greats. “They must have been having off days”, Mark insists! To date, Mark has won nine National Championships at various levels while also representing his country on ten occasions; with a second-place finish at Advanced Level in a World Championship being his best success. Mark had moved across to display flying at an early age. “On a farm labourers wage you couldn’t earn enough to pay for your fuel to go flying” so with his aerobatic competition track record opening doors, he started to display. Effectively, “the display flying paid for the competition flying while it also provided free practice for the competitions”! Since then, Mark has continued to provide world-class aerobatic solo displays and those who make the annual pilgrimage to the BBC Children-in–need event at Little Gransden and have witnessed Mark’s ‘standard departure’ and spectacular gyroscopic figures will know exactly what I am referring to. Mark has always recognised the need to stay ahead of the competition, either with new, fresh manoeuvres or by joining two or more aircraft together. 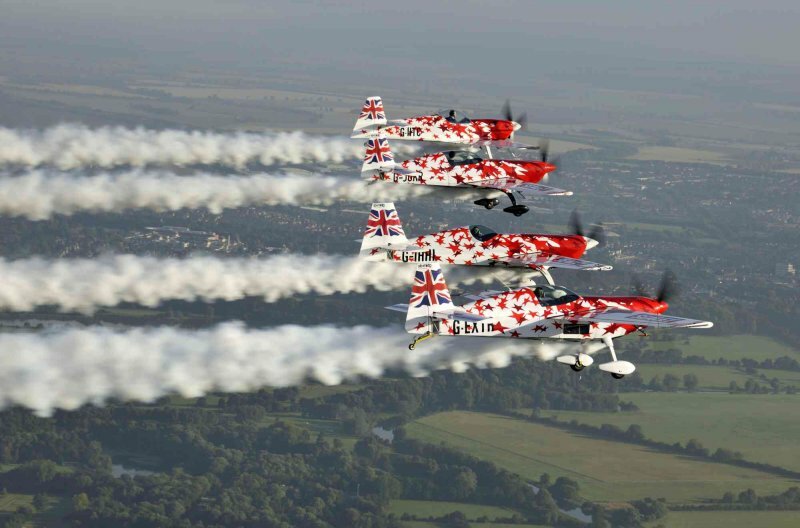 Originally, Mark had joined forces with Andy Bickmore and flew a pair’s routine at an event in China, but soon afterwards approached Tom Cassells – another well-known ‘name’ in both Unlimited competition and display aerobatics – to form The Global Stars, a team that very quickly grew their popularity. Why rest on your laurels though, and Mark soon organised a four-ship display team for a large Chinese event in May 2014 and The Global Stars – flown by Tom Cassells, John Taylor, Chris Burkett and Mark – flying four Extra designs were born. However, after completing the Chinese commitment, Mark then flew into Korea and just a few days later flew a four-ship Global Stars display in four Yak-50 aircraft, with three different pilots -Rolandas Paksas (the former President and Prime Minister of Lithuania, Robertas Noreika and Algimantais Zentelis. 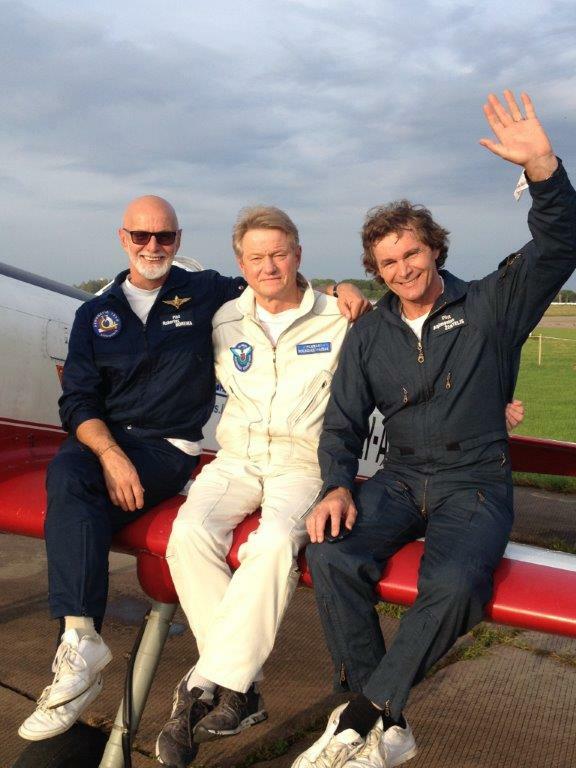 Mark also recognised the need to have the very best aerobatic pilots in The Global Stars. The normal line-up and that which flew during the Pilot photoshoot seen here, is led by Tom Cassells flying a Cap 232; Steve Carver flying an Extra EA260 on the left, in position number 3; Mark Jefferies flying on the right in an Extra 330/SC, in position number 2; with Chris Burkett in an Extra 300/L flying the box. However, Steve Carver has a fulltime job as an airline pilot, so the team needs to have more than just four pilots to call upon, to provide its world-wide commitments. The line-up is supplemented by the very talented Michael Pickin (who was the UK’s youngest ever authorised display pilot in the UK and is currently UK aerobatic champion at Advanced level) and Chris Heames (a former RAF fast-jet instructor who is a well-known formation instructor at North Weald, while also retaining a fast-jet DA, and also displays some of the quirky, vintage gliders at Old Warden). It is an impressive line-up of pilots! Flying a variety of types within the team does provide a few problems but In Mark’s opinion, all are fairly similar in terms of power and weight although the roll rate of the Cap 232 is significantly better than any of the Extra aircraft so for Tom in the lead “he has to fly extremely carefully, limiting the control inputs and restricting power to around 21-inches”. The Global Stars have another trick up their sleeves with a specially designed smoke system fitted to all of their aircraft. Designed by computer-wizard Richard Parkinson, it was originally conceived by Mark for the World Aerobatic Championship at Silverstone in 2009 to provide him within an interesting ‘edge’ over his competitors as the subjective scoring system also took into account ‘the use of smoke’ as a judging criteria. With The Global Stars, the ‘dotty’ presentation of smoke can now be synchronised between all four aircraft while it also assists in stretching the duration of smoke available on each aircraft. A normal display lasts 12-15 minutes but none of the aircraft have sufficient capacity to last for that length of time if used continuously. The clever system will also allow the co-ordination of continuous or dotty smoke to be selected as and when either is required. 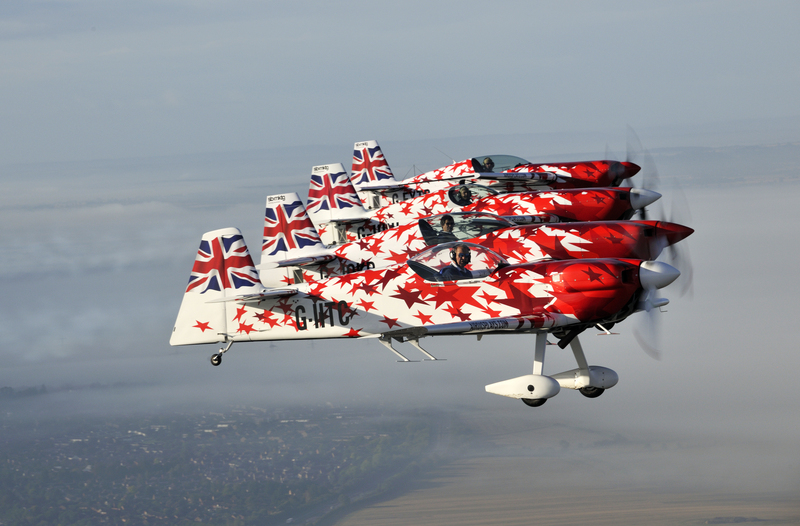 Added to the spectacular and unmistakable identical colour scheme carried by each aircraft in the formation – cleverly utilising modern graphics capabilities – it ensures that the team have a significant dose of presence wherever they appear. The 2017 routine for The Global Stars in significantly more advanced than in previous years, in preparation for the forthcoming Formation Aerobatic Championships to be held in China during April. The Team’s recent series of displays at an aviation conference in Vijayawada, India during mid-January 2017, allowed them much-needed time to practice while also fine-tuning their routine ahead of the competition. The new, 2017 routine, opens with a special manoeuvre called the ‘Butterfly Loop’ which was invented ahead of the forthcoming championship. Mark admits there are only a limited number of manoeuvres that can be flown during a formation display routine, so he was keen to invent something new. It’s a manoeuvre which involves a mixture of loops and rolls to complete the sequence and is not easy to fly well; consequently, it will test all of the teams competing. 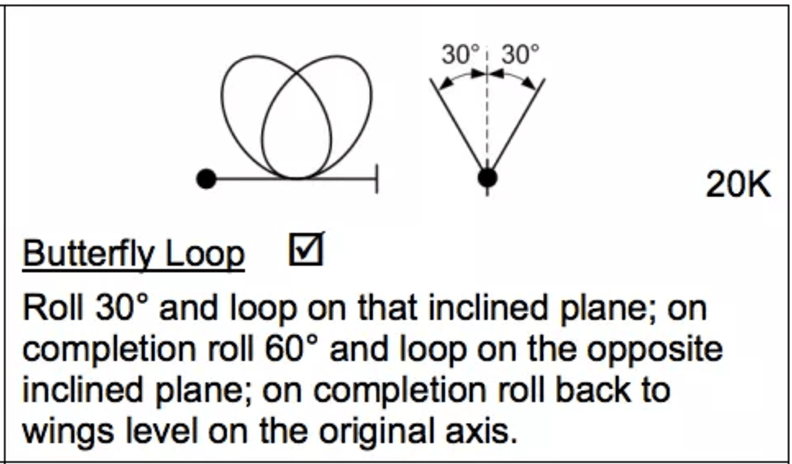 That opening is followed by a ‘quarter clover’ on the way up, a steep wing-over, then a loop with a roll on the way down, before entering a formation ‘half-cuban’ – something Mark feels is not often attempted by formations as “it is technically difficult”. A classic barrel-roll, followed by another wing-over with formation changes being thrown in for good measure, followed by a 360º-turn to meet a judging criteria for the Championships will be followed with a some breaks, opposition pairs manoeuvres including a mirror pass. Then some stunning solo ‘Jefferies’ unlimited gyroscopic figures are thrown in while the team prepare for the inverted mirror pass and double roll-around before rejoining as a four-ship to complete the complex 12-minute sequence. keep the G-forces down to -5G at the bottom of the loops; tough, but nowhere near as tough as an Unlimited solo sequence! 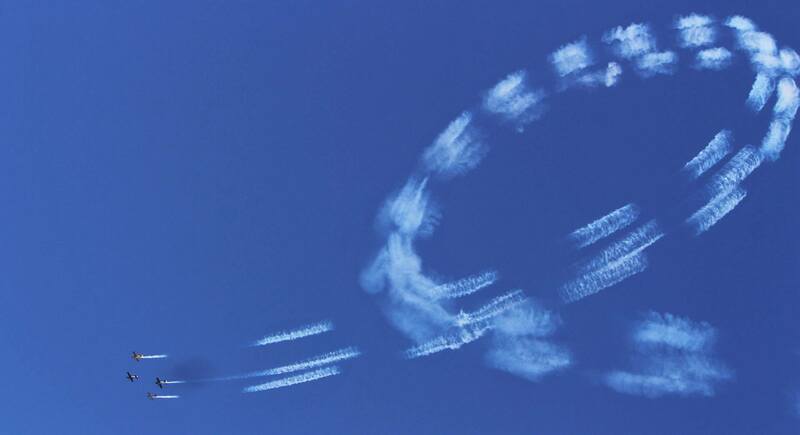 If the formation display flying is demanding, spare a thought for the person who has to deal with the logistics. Thankfully, a number of team members own more than one aircraft allowing display mounts to be sent on to destinations ahead of the event. For the recent trip to India, three of Mark’s Extra aircraft accompanied Steve Carvers ‘spare’ Extra 260 in containers and were shipped to India. Once there, Mark and engineers flew out to re-assemble the aircraft and test fly them all ahead of the displays. This allows the team of four pilots to fly four similar aircraft. For most overseas shows, two shipping containers are used, with two aircraft in each. While this reduces expenses by around £2,500, it slightly increases the risk of using four separate containers. After displaying in India, three of Mark’s Extra aircraft, along with Steve Carver’s Extra 260 are now in transit, half-way between India and Shanghai, where they are due to arrive on 26 February. 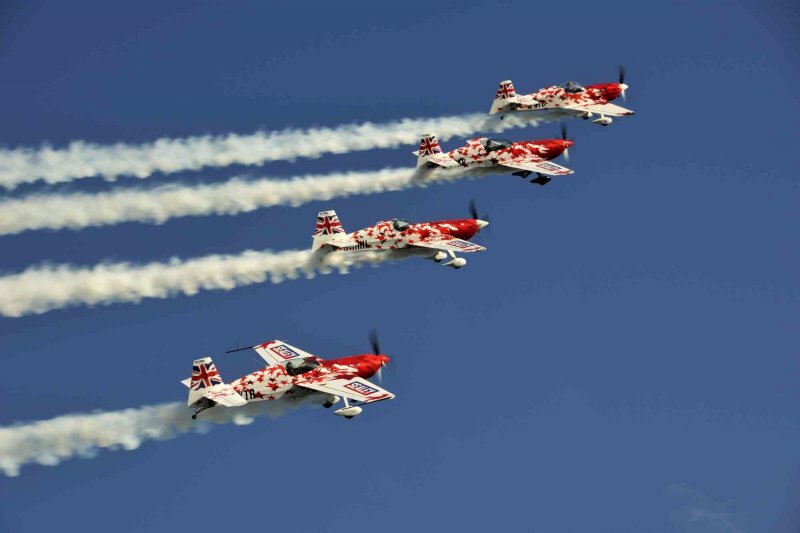 An eight-hour road trip is required to reach their destination at Shangjie where they will be met and assembled for use by The Global Stars in the Formation Aerobatic Championships. However, once the event is concluded, Mark plans to leave two aircraft out in China, to provide display aircraft to various Asian airshow organisers in the coming year. The remaining two aircraft will be returned using the new train service from China to Hamburg. They will then be re-assembled at a local airfield in Germany before being flown into Holland for The Global Stars first European event at Oostwold on 4-5th June. Tom Cassells will fly his Cap 232 out from Yorkshire, while Michael Pickin will fly his Cap 232 out from Kent. Mark and Steve Carver will collect the two aircraft from Germany and fly them into Holland for the show, before all four aircraft will be flown back to the UK. performing predominantly in Bahrain, Asia and China. However, in 2017, they will also be performing at a large number of UK events including Old Warden, Chatsworth, Broadstairs and Blackpool. The forthcoming Formation Aerobatic Championships will be conducted in China, with FAI approval to Class 2, meaning it will be entry by invitation rather than through a world body. The event is being organised by World Air Carnival Limited, a company set up specifically to stage aviation events worldwide. In 2017, the Formation Aerobatic Championships will be held from 29 April to 1 May and this is an exciting new event on the world airshow calendar. Twelve teams have entered from Romania, Lithuania, France, Spain, Italy, Russia, Australia, South Africa (2), and Great Britain (3) – all competing in piston-powered aircraft. Sadly, no US team was available to participate. 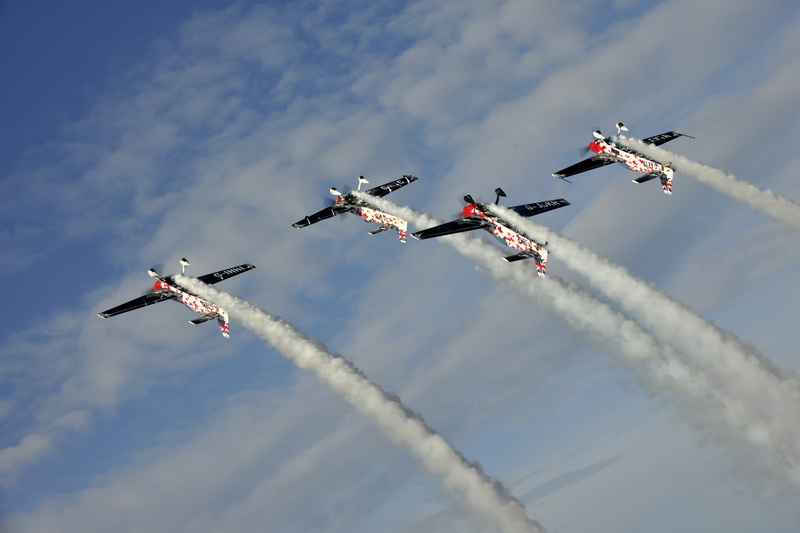 It will be judged on normal aerobatic competition ARESTI lines for two sequences – ‘Classic’ and ‘Signature’. The ‘Classic’ sequence is designed by the teams for maximum K-factor, using pre-described figures with any linking figure of choice. The expected sequence endurance is 4½ – 5 minutes, with a maximum of 8 minutes. 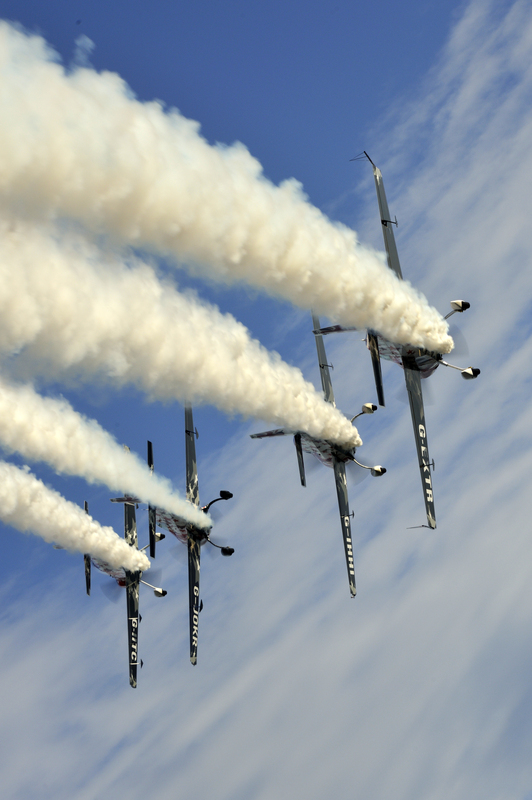 The ‘Signature’ flight is for each team to fly their very best air display routine in a 11–12 minute slot. The Global Stars are far better than the sum of its parts. 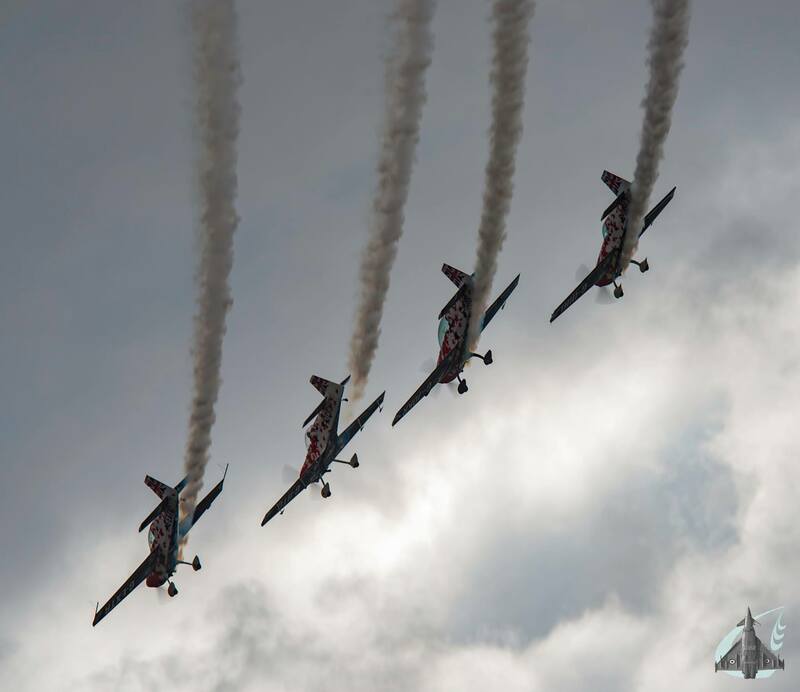 Individually, they all great aerobatic pilots, but together they become a tight and spectacular display team performing with lots of the WOW factor They are always willing to try and master something new and difficult , while ensuring they always perform right in front of the spectators. The Global Stars are available for air shows, weddings and all kinds of events.